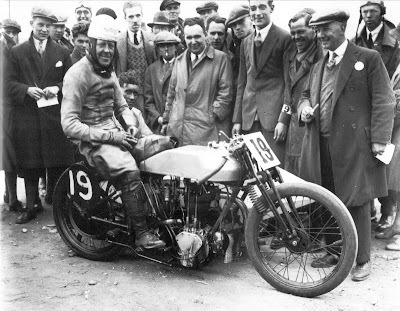 I have found the attached picture of Tucker immediately after the win in the 1929 200 mile race - the numbers are the same. The engine is clearly an ES2 but the frame is earlier and the forks are certainly side spring braced Druids. A noticeable change is the loss of the tank lining or perhaps a new tank was put on for the publicity pictures! Like other Brooklands riders of the period, George Tucker would have kept using his machines until they were no longer serviceable. The mid to late 1920s were a period of severe shortages with a general strike in 1926 and the depression beginning to bite in 1929 - Pat was still using his 1925 TT machine in 1929 and possibly later. Tucker's frame is likely to have been made around 1927 and the forks could even be the 1925 TT ones - the 1925 machines used the four speed cross over gearbox so it is not that one. The rear brakes remained the V-block type until the end of the flat tankers at Brooklands presumably because they were lighter. The frame would be a Model 19 to take the taller engine which also has the ES2 head with the angled exhaust port. I suspect that Norton supplied the engine - or parts - for racing as Simon has told me that the Model 19 crank won't fit the ES2 cases and I don't think that Norton sold a bigger ES2. Tucker probably would not have had the resources to make his crankshaft and that this would therefore have been done by the works as he was a tuner rather than an engineer much like Driscoll who had others do the engineering. George was a Norton main dealer in Bristol so he would have access to factory components even if he was not officially supported by the works by that time. He did win a Grand Pix with Walter Moore in the chair in 1923/4. The race report says that all three Nortons were 588cc which is what I would expect. Tucker didn't use long (8 1/2") conrods in his 490cc engines (JdK: which makes the 490cc engines appear as 588cc models) as these were only used by the Spring/Driscoll team from what I have seen. O'Donovan did try a long rod around 1926 but he used an 8" rod from the 588 as did Pat around the same time. Simon: "There were a few 588 ES2 engines made/sold by Nortons. It is only the differing main shaft diameters which means that standard 588 flywheels can't be used in ES2s."